Praise dancewear, worship dance attire, Dance Fashions Warehouse, worship dance dresses, praise dance dresses, christian dance wear, mens and boys praise wear, praise tunics, praise overlays, liturgical dance dresses, worship pants, worship tops, flamenco dresses,spirutial dance wear, cheap praise wear in Atlanta. - 650 Student Footlight. 2" Student Leather Footlight by Capezio. 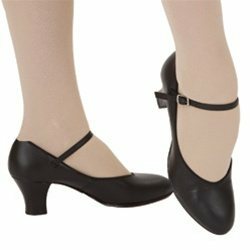 An excellent choice for tap, jazz and stage, this shoe features a 2" plastic heel, a leather heel lift and a scored leather sole. Made of full-grain leather, this shoe has a flattering tapered toe and takes both Capezio or Selva Staccato taps. The Cambrelle lining adds comfort to this durable, long-lasting shoe. Refer to the Tap Fitting Guide: Student Footlight to find the size and style of tap that best fits this shoe.